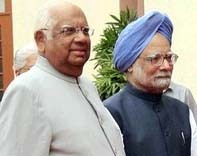 24 July :Prime Minister Manmohan Singh on Thursday met Lok Sabha Speaker Somnath Chatterjee, a day after the veteran Marxist was expelled from the CPI(M) for refusing to quit after the party withdrew support to the UPA. Singh, who drove to Chatterjee’s residence in New Delhi on Thursday morning, did not speak to he waiting reporters after the meeting that lasted about 10 minutes. The CPI-M politburo unanimously expelled Chatterjee from the primary membership of the party he has served for over four decades. The 79-year old barrister and ten-time MP, Chatterjee rejected both subtle and explicit hints from the party leadership, which asked him to quit the post to which he was elected unanimously after the 2004 elections, saying he was above party politics given the post he held. Chatterjee has had a stream of UPA leaders visiting him after hearing about his expulsion to express their solidarity and support.RJD leader and Railway Minister Lalu Yadav who met him with one of his daughters, said, "Now the only thing left for CPI-M is to expel Jyoti Babu. They have lost their minds. He taught them ideology. The Left has thrown him out on a whim. Prakash Karat can never attain his stature. "Mulayam Singh Yadav and Amar Singh of the Samajwadi Party and have also conveyed their support to Chatterjee. Finance Minister P Chidambaram was the first minister to visit him after the expulsion was announced. Minister for Water Resources Saiffudin Soz, who also met the Speaker, said "Withdrawal of support to us was a mistake made by the Left. Now, expelling him is another big mistake….I had been hearing for the past four months from the Speaker that he wanted to resign." Home Minister Shivraj Patil paid a short visit. Parliamentary Affairs Minister Vyalar Ravi praised Chatterjee after paying a "courtesy call" on him. "What the CPI-M has done is most unfortunate. They have shown disrespect to him. Everybody who believes in democracy would condemn this," he said. Devendra Prasad Yadav and Anirudh Prasad alias Sadhu Yadav of the RJD also visited him and told reporters that they would welcome Chatterjee into their party with open arms. There were many supporters who sent bouquets to him to show support.Priya Dutt, MP and brother of Sanjay Dutt, was one of them. Earlier,Lok Sabha Speaker Somnath Chatterjee was expelled by CPI (M) climaxing a fortnight-long defiance of the veteran parliamentarian to quit at the call of the party with which he was associated for four decades. "The Polit Bureau of the CPI (M) has unanimously decided to expel Somnath Chatterjee from the membership of the party with immediate effect," said a statement after a Polit Bureau meeting chaired by General Secretary Prakash Karat on Wednesday, that discussed his defiance ever since the party withdrew support to the UPA government. The party invoked Article 19 (13) of its constitution to expel him under summary procedures without any notice on the charge of "seriously compromising" the party position. Biman Bose, a senior party leader from West Bengal who reportedly met the Speaker on Tuesday night asking him to quit ahead of the trust, said Chatterjee had promised to give up the office on 23rd July. "Somnath Chatterjee has violated party discipline. We (Communists) have to abid by party rules. The party will sever all connections with those who do not follow party diktats," he said. The veteran parliamentarian’s problems with the CPI (M) leadership are said to date back to the days when he had supported the proposal for Prime Ministership for Jyoti Basu, which was vetoed. Again, he is said to be miffed with the leadership over their lukewarm attitude to the possibility of Chatterjee being made the UPA-Left’s consensus candidate for the Presidency last year. Over the last fortnight, Chatterjee, who was incensed with the CPI (M) including his name in the list of MPs withdrawing support to the UPA government, had been maintaining that he would take an appropriate decision. But it became increasingly clear that he was not going to oblige the party diktat. Even on Wednesday he maintained he may be going to Kuala Lumpur for a Commonwealth Parliamentary Conference early next month. The party hoped that Chatterjee, who was leader of its Parliamentary Party in the Lok Sabha for some time, would quit before the confidence vote on Monday, but he went ahead and presided over the proceedings of the two-day Special Session that ended on Tuesday. Even the intervention of CPI (M) patriarch Jyoti Basu and some other senior leaders failed to convince the Speaker that he may have to give up the post in the light of the changed situation. The CPI (M)’s decision on Wednesday may be the first of its kind in the country where a party severs its links with a person in such a post. Chatterjee, the first Marxist to become a Lok Sabha Speaker, had been a member of the Lower House since 1971 except for a short break in 1984 when he lost to Mamata Banerjee. He returned to the House in a bye-election. The Speaker declined to comment on the decision. While leaders of the Left parties attacked the Speaker, the Congress and its ally RJD spoke highly of his conduct as a presiding officer. Congress spokesperson Jayanthi Natarajan said Chatterjee has been an "exceptionally good" Speaker who has been fair and upright. "In any parliamentary democracy this is unprecedented," she said referring to the CPI (M) decision. Senior RJD leader and Union Minister Raghuvansh Prasad Singh described CPI (M)’s decision as "ridiculous and unfortunate".